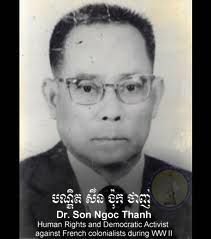 Son Ngoc Thanh (December 7, 1908 - August 8, 1977) was a Cambodian nationalist and republican policitian, with a long history as a rebel and (for brief periods) a government minister. After demonstrations against the French in July 1942, Thanh fled to Japan, returning when Sihanouk declared Cambodia's independence on March 12, 1945, during the Japanese occupation. In August, Thanh became Prime Minister. With the restoration of French control in October, he was arrested, and sent into exile first in Saigon and then in France. Many of his supporters joined the Khmer Issarak resistance to fight the colonial power. In 1951, the authorities brought Thanh back, to considerable popular acclaim; refusing a Cabinet position, he made alliances with various leaders of the Khmer Issarak rebels, and established another newspaper (Khmer Kraok) which advocated revolt against the French administration and was quickly banned. "I love my Khmer country (patrie Khmère) wrote to Karpolès from France in 1941. But still after spending seventeen months in a colonial prison, he professed "a debt of gratitude to France," not only personally, but for "the good works France has done for Cambodge and in the Khmer provinces of Cochin-china". It was apparently a source of personal satisfaction and professional pride that he had fulfilled his duty to his country as a Cambodian, while remaining loyal, grateful, and worthy of France. Now he considered his career in politics finished and wanted nothing more than to return to the land of his ancestors in Travinh (187). This was either posturing or wishful thinking. Together with another Khmer Kraom, Son Ngoc Minh, Son Ngoc Thanh mobilized a small army of freedom fighters known as Khmer Issarak (Free Khmer). The French administration made various concessions to political freedom, including allowing Cambodge's first elections for the National Assembly in 1947.